To do so, Horton-Perinchief is taking advantage of the new diving facility at the National Aquatics Centre to run a diving summer camp for children. 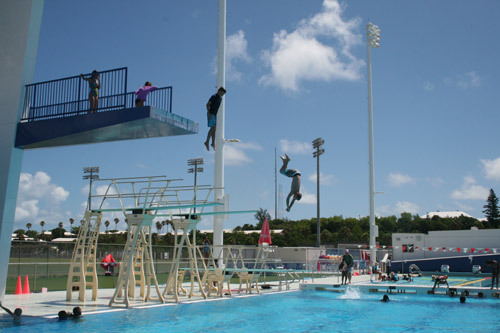 “We’ve never had a diving pool or facility before, so this is just a great opportunity to introduce these kids to a sport that they already love, because they do it off the rocks,” she told the Bermuda Sun. The camp is in its second week and there has already been an overwhelming response from the children. “So far it’s been amazing, last week was incredible. We’ve seen a week and a day of kids, and some of them are really quite incredible. I was hoping to get about 10 kids a week, but we’ve maxed out at about 20. The next step for Horton-Perinchief is to enclose the facility in a bubble to allow year-round training. “If this pool was enclosed in a bubble, we could do it year-round, and really that’s what it’s going to take to build diving and develop divers. We already have so much raw talent that I’d love to work with them year-round.